Brisbane, Gold Coast & Sunshine Coast. Australia. Established 1983. 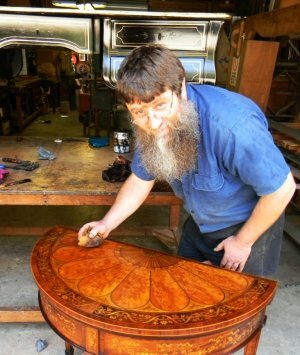 Antique conservation, furniture restoration and reproductions (replicas). Antique interiors, Custom classic furniture. Corporate executive furniture. Libraries. Intricate and heritage joinery. Superyacht, aircraft, horse drawn vehicles and vintage car interiors. 22ct gold embossed leather inserts for desks. Traditional upholstery, French polishing, faux finishes, inlays, baise and felt, gilding, cane and wicker, carving, turning, metal work and fittings. Also Clock, Box, Frame, Artifact, Gramophone, Telephone and Photograph restoration. See also 'Gold embossing on leather' category. 8am to 4.30pm Mon to Fri. Ring or email first, please.